We have a new lab’ tech – Mary Day – who joined us from SUNY Oswego via the UR clinical labs). Mary will be taking over the management of our mouse colonies, among other things. We also have a student in the GEBS summer scholar’s program – Irma Ruiz-Concepcion, from Tulane University in New Orleans, who will be looking at respiratory super-complexes in mouse hearts. Our latest paper on the the role (or not!) of acetylation as a regulator of 2-hydroxyglutarate generation, is now up as a pre-print on BioRxiv. Also our collaborator Paul Trippier’s paper on novel complex II inhibitors was accepted. We also have a number of other papers in the pipeline this summer, from colaborations with Michael O’Reilly, Xin Li, Gail Johnson, Vadim Ten, and Daniel Acuna. Plus a chapter on mitochondria and nitric oxide in the upcoming 3rd edition of Ignarro’s “NO Bible“, co-authored with Sruti Shiva and Laura Castro. The Biochem. J. review on mito’ K+ channels should be out any day now. (1) We hired a new technician who will be starting after Memorial Day. (2) Congratulations to Jimmy Zhang (MSTP student), who got an F30 fellowship funded. Now begins the fun process of divesting from an AHA fellowship that he got funded late last year. That in itself involved extrication from his inclusion on a training grant beforehand. First world problems. (3) Congrat’s also to Dr. Sergiy Nadtochiy, who has been promoted to Assistant Professor (tenure track) in the Department of Neurology. Sergiy is now a qualified anatomy instructor in the medical school and a key teacher in the HSF (human structure and function) physiology course. Luckily for us he still gets to hang out in the lab’ and do experiments 20% of the time. (4) The competing renewal application for R01-HL-071158 received a 12th percentile score. Current NHLBI payline is 15%, so assuming nothing crazy happens* between now and the end of the fiscal year, we’ll hopefully be receiving a notice-of-award later this summer. (*not guaranteed given the current state of affairs in Washington DC). (5) Due to the above, the money we had been planning to use for a no-cost-extension, is now planned to be used for the purchase of a refurbished mass-spec’. We’re hoping to take delivery soon of a ThermoScientific TSQ Quantum Access Max, which will be hooked up to or existing Shimadzu LC rig to give us an in-house LC-MS/MS capabilities, for metabolomics and other small molecule analysis. (6) Our review on mitochondrial K+ channels is still not out yet. Apparently Biochemical Journal doesn’t publish review articles, even on-line, until they’re given page numbers in the print version of the journal. (7) Our paper in JBC last year was essentially vindicated by a new paper in Nature Chemical Biology, but the authors chose not to cite us, which is kind of not nice. (8) We’re getting a GEBS summer scholar student for this year, for June and July. (9) Paul gave a talk at the Biopysical Society annual meeting in New Orleans in February, and at Medical College of Wisconsin in April. Additionally I had a very enjoyable visit to the Biological Sciences Department at LeMoyne University in Syracuse, to discuss our research and PhD programs with their really bright undergrads. (10) Several members of the lab’ will be attending/presenting at the APS Physiological Bioenergetics meeting in San Diego this August. (11) Lots of progress (retractions etc.) on various scientific misconduct cases I’m involved with (Saad, Aggarwal, Lee). Sadly, many other cases reported on PubPeer (such as this one) have yet to be dealt with by the journals despite multiple attempts at badgering them to do the right thing. (12) Paul may or may not have been involved in discussions with various reporters who’ve published some critical pieces about certain scientists this spring. There’s more to come on some prominent players in this area! (13) After some procrastination and a original idea to go on hiatus, UMDF decided that, after all, they were going to have a grant program this year. So, instead of the usual cycle spread over 6 months (letters-of-intent, triage, review, invite full applications, triage, review, in-person meeting, council, awards), we’re doing a condensed format (<2 months total) with a targeted RFA. So far it’s been going well despite the short time-line. Hopefully will reap rewards down the line for mito’ patients. (14) Papers to come this summer… Owen’s paper on the Slo2.1-/- mouse. Yves’ paper on mitoUPR and cardioprotection. Jimmy’s paper on succinate in cardiac ischemia. Sergiy’s paper on lysine acetylation and hydroxyglutarate. I should stop updating this post and go do some writing! We’re at the “Mitochondrial Communication” Keystone Symposium (Jan 14-18). Here’s a PDF of the poster. It’s essentially the same material as in this JBC paper, but with some new data at the end, on the protective effects of a dimethyl-L-2-hydroxyglutarate ester. Paul will also be speaking at the Bioenergetics Subgroup of the Biophysical Society, at their annual meeting in New Orleans next month. The competing reenewal for R01-HL071158 was submitted last fall and will be reviewed in February. The proposal contains some further development of our work on acidosis and metabolic signaling, building on the JBC paper above. We submitted an invited eview article on mitochondrial potassium channels to Biochemical Journal, which should be out this summer. Congrat’s to our MSTP student Jimmy Zhang, who got an AHA pre-doc’ fellowship funded! (1) Very few of the news outlets even bother to report which journal the study is published in. If you’re a science reporter worth your salt, FFS at least tell the public where to go to find out more! (2) For those outlets that did list the source, the UK’s Daily Mail got it wrong, claiming it was published in BMJ Open, rather than the actual venue, the BMJ. Some got the journal correct but didn’t actually provide a hyper-link to the paper. Time got the journal correct, and provided a link, but it was a dead link! (they linked to the wrong issue of the journal). (3) The end point measured in the study was Heart Failure. I would hope it’s not necessary to explain that heart attack and heart failure are not the same thing! Heart attack is an acute (short term) phenomenon, involving blockage of coronary arteries starving the heart of oxygen and causing it to stop functioning. Heart failure is a progressive long-term condition that involves structural changes to the heart muscle, resulting in impaired heart function. When reporters use phrases like “trigger heart problems”, implying short-term effects, it’s clear they mean heart attack, and don’t understand the distinction from heart failure. Here’s what was actually done…The authors of the study (here’s an actual working link to it) asked a bunch of people whether they’d taken NSAIDs (non-steroidal anti-inflammatory drugs), then stratified them into 2 groups – those who had done so within the past couple of weeks, and those who had done so more than 6 months ago. They then looked at how many of those people were admitted to hospital with heart failure. 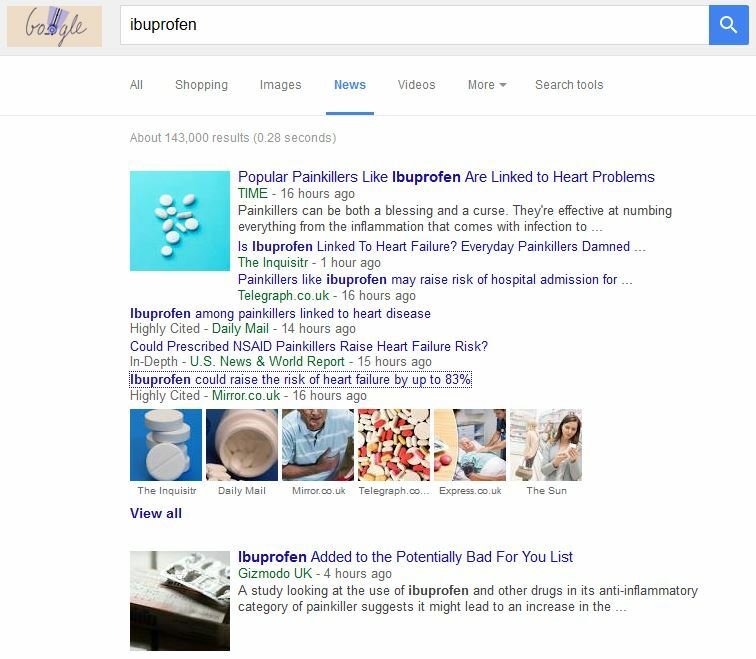 What they found, is that about 20% more people in the recent NSAID group ended up in hospital for heart failure. THIS DOES NOT MEAN NSAIDS CAUSE HEART FAILURE !!! What it means, is there’s a very slight positive correlation between being admitted to hospital for heart failure, and having taken an NSAID in the past couple of weeks. Firstly, there are a whole bunch of problems with one of the things being measured… namely, being admitted to hospital for heart failure may not actually mean you have heart failure. It’s a pretty wide diagnostic spectrum to begin with (several different scales available from the different interested bodies, NYHA, BHF, AHA etc. ), and of course there’s the possiblity that the patients may not have actually ended up being diagnosed with true structural HF at all. Secondly, it’s important to emphasize that the 2 things (HF hospitalization & NSAID use) correlate, but it is not possible to say which one of the two was causative! In particular, there’s no way to exclude that the people who took NSAIDS did so BECAUSE they were suffering from heart failure !!! What does heart failure do to a person? Well, generally, it results in shortness of breath and the inability to get around, get up stairs, walk long distances, etc. As a result, such persons would be expected to be more sedentary. Well guess what happens if you don’t exercise or move around… aches and pains! And what do most people do when they have aches or pains? Pop an NSAID! There is a very real possibility that people may have been taking more NSAIDs because they had heart failure. This could be why HF and NSAID use are correlated. Of course, sick people popping more pain med’s doesn’t make for such attractive, attention-grabbing headlines as “drugs do bad things”. There’s also the problem that many NSAIDs are contra-indicated for use in patients taking many popular high blood pressure medications (ACE inhibitors, ARBs, beta blockers, etc). High blood pressure is one of the leading (if not THE leading) risk factors for heart failure. So, it might be expected that at least some of the patients in the study who went into hospital for heart failure had high blood pressure and were taking anti-hypertensive medications. Given the already widely-known ability of NSAIDs to do bad things in patients on such medications, could we simply be looking at a re-statement of a well-known drug interaction result here? By choosing HF as an end point, did the authors accidentally select for patients who are on drugs that NSAIDs interact badly with? Either way, it’s clear we have a long way to go, to educate science journalists to avoid this continued sensationalism in their reporting. Maybe NSAIDs do cause heart failure, but this study doesn’t actually prove that point. Today we posted a pre-print on BioRxiv for the first time. Here‘s the paper, entitled “Acidic pH is a Metabolic Switch for 2-Hydroxyglutarate Generation”. It reports pretty much what the title says! A little background… 2-HG has been known about for quite some time as an “oncometabolite”, with the D enantiomer (D-2-HG) being made by mutant forms of isocitrate dehydrogenase found in various cancers. However, that all changed last year with 2 back-to-back papers in Cell Metabolism from the labs of Craig Thompson & Joe Loscalzo, reporting that L-2-HG is made in response to hypoxia, by the enzymes lactate deydrogenase and malate dehydrogenase (side note – we also found 2-HG elevated in the ischemic heart as early as 2013, but were slow in publishing). We’ve been messing around with 2-HG regulation for a while, and just sort of stumbled on the fact that the enzymes that make and degrade it are all sensitive to pH. This makes sense when you consider that acidic pH is a common feature of hypoxia, and it’s also found in the tumor micro-environment, so our results might also be relevant for cancer. The other upshot – this work might be relevant for a set of devastating metabolic diseases, the 2-hydroxyglutaric-acidurias. These often co-present with lactic acidosis, so it’s possible that lactic acid crises may be precipitating events. This suggests that careful management of pH in these patients (e.g. using dichloroacetate to drive PDH activity) might be therapeutically beneficial. The work is currently churning its way through the regular journal peer review system, but you’ll see if you read the paper that the experiments are actually pretty simple. As such, we thought the results might be particularly “scoop-worthy”, and so that drove the decision to post a pre-print. This was our first time posting on BiRxiv (kinda like our most recent paper was the first time we posted a complete underlying data set on FigShare). Both processes were completely intuitive and painless. I’m beginning to like this open science game!